The striped newt (Notophthalmus perstriatus) is a small salamander species with a very restricted global range — it is found only in northern Florida and southeastern Georgia. Striped newts spend the majority of their time in the uplands (mostly below ground) and utilize wetlands only for breeding. They have been found almost 1/2 mile from the nearest breeding pond. Striped newts live in fire-maintained, dry sandy habitat like sandhills and scrub and depend on isolated, herbaceous, ephemeral wetlands as breeding habitat. These are marsh wetlands that do not hold water year round and therefore do not harbor fish. They are a unique landscape feature and, due to their often small size, have little to no environmental protections. Striped newts are winter-breeders. They typically migrate to their breeding wetland in late fall/early winter when cold fronts refill the wetlands. Adults remain in the wetland for several weeks. Their larvae are aquatic and take 6-9 months to fully mature. Newts, along with some other salamander species, have a complex life cycle. Larval striped newts can ‘decide’ to remain in a wetland instead of metamorphosing into a terrestrial eft and migrating to upland habitat. These larvae that remain in the wetland can then become sexually mature (we call them paedomorphs) while retaining larval characteristics like external gills and keeled tail (see pic below). If the wetland begins to dry or food resources decrease, the paedomorph can absorb its gills, become a terrestrial adult, and leave the wetland. In 2008, we petitioned the US Fish and Wildlife Service to list the striped newt as a federally threatened species under the Endangered Species Act. Although the USFWS ruled that listing was warranted, the striped newt’s listing is precluded by higher priority actions. Basically, there is a backlog of species awaiting listing and the striped newts has been ranked Priority 8 out of 12 (a ranking of 1 being the highest priority). Each year the USFWS reviews the status of species awaiting listing. Click here to read our petition to list. The striped newt population in the Apalachicola National Forest declined to undetectable levels in the early 2000’s. During the 1990s, we were able to detect striped newts in known breeding wetlands about half the time we sampled. By 2011, we had not seen a larval striped newt in 13 years. We detected 4 adult striped newts in 2 wetlands in 2006 and 2007 but none since that time. This severe decline instigated our coordination with the US Forest Service to create a self-sustaining population in the ANF – to bring the striped newt back to an area which once harbored one of the largest populations in the world. Since that time, our project has grown to include many agencies, zoos, and organizations. Reports from each year of our project can be accessed from our Publication page. 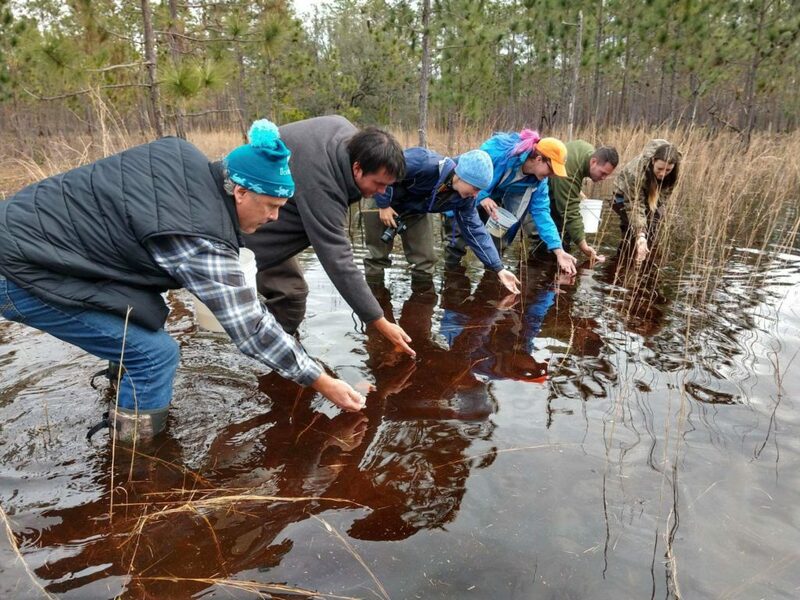 Releasing captive-bred striped newts into an Apalachicola National Forest wetland.